The SOTA LightWorks LW1 Product Manual SOTA Instruments Inc. Please read this manual thoroughly before using your LightWorks. This is the most up-to-date manual. heat-producing or heat-sensitive ointments, lotions or medications as a skin burn may occur. light-sensitive medications, please consult your health care provider prior to using the LightWorks. GREEN: Indicates which mode is selected. ORANGE: Indicates that the Automatic Option is in operation. Remove the protective cover from the lens on both sides of the Hand Paddle. Plug one end of the LightWorks Cord into the Hand Paddle and the other end into the Base. When properly inserted, the plugs will click securely into the jacks. Push the ON/OFF/MODE button. All the lights on the base will flash in sequence to indicate the unit is ready for use. The unit starts in the Automatic (AUTO) Option and begins with the Constant Mode. The AUTO light will flash continuously. 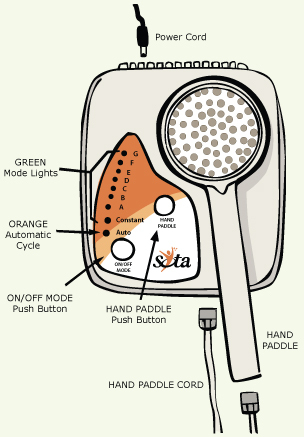 Select one side of the Hand Paddle by pushing the Hand Paddle button. Only one side of the Hand Paddle is operational at a time. Push the Hand Paddle button to check the operation of each side of the Hand Paddle. The unit can be left in AUTO or a specific Mode can be selected. In AUTO, the unit will operate on the selected side of the Hand Paddle for 32 minutes—4 minutes on each of the 8 Modes. The unit sounds a 'beep' after each 4 minute Mode has completed. Manual Option: Choose a specific Mode by pushing the ON/OFF/MODE button briefly. A GREEN light indicates which Mode is selected. The Constant Mode operates for 30 minutes and Modes A - G for 15 minutes each. To return to the AUTO Option continue pressing the ON/OFF/MODE button until the ORANGE light comes on. See 'Output of Modes' below for the frequency of each Mode. The LED lights on the Hand Paddle should be placed on or very close to the skin. Clothing will block the light. When any of the timed cycles finish, the unit will beep. To continue with another cycle, push the ON/OFF/MODE button within 20 seconds of the beep. The unit turns itself off if the ON/OFF/MODE button is not pushed within this time. To turn the unit off before the end of a cycle, hold the ON/OFF/MODE button down for a full two seconds. Note: With the unit off, when unplugging the Wall Adaptor or the LightWorks Cord, the lights on the Hand Paddle may flash briefly—this is normal. Hand Paddle: The Hand Paddle can be changed from side to side at any time during a timed session. The Hand Paddle casing for the LED lights may become very warm with extended use. If it feels uncomfortable, turn it off and allow it to cool before continuing. Timing: When either the Mode or Hand Paddle setting is changed the timing is reset. Cleaning the Hand Paddle Lenses: Use a damp cloth. Do not spray water directly on the Hand Paddle as this risks moisture entering the casing. Do not use abrasive chemicals on the plastic. Infrared Side: When this side of the Hand Paddle is selected, only the 5 Red LED lights will be visible to the eye. Most individuals will not feel any sensation while using the LightWorks. Length of Session: It is best to begin slowly and then gradually increase the length of each session. Daily use varies from 4 to 32 minutes or more. Length of Use: When used as part of a Wellness Protocol, use every other day. For specific purposes, longer and more frequent sessions may be more beneficial. Generally, the LightWorks can be used as needed. Placement: The Hand Paddle may be kept on one location or it may be moved at any time to different locations. When using the AUTO option, the LightWorks is timed for 4 minutes on each of the 8 Modes for a total of 32 minutes. When using the MANUAL option, Constant Mode is timed for 30 minutes. Modes A - G operate for 15 minutes each. In Manual Option, Modes A - G is per 15 minutes and Constant Mode is per 30 minutes. In Automatic Option, output is per 32 minutes (4 minutes in each Mode). To operate the LightWorks from a 12 Volt DC source, such as an automobile battery or an appropriate Solar Panel, purchase a Universal Power Cord with Tip or Center Positive. Red LEDs: Features 60 high-intensity Red LED lights with a wavelength of 660 nanometers (nm) (+/- 10 nm) and a light output of approximately 245 milliwatts (mW)*. Near Infrared LEDs: Features 55 high-intensity Near Infrared invisible LED lights with a wavelength of 880 nanometers (nm) (+/- 10 nm) plus 5 visible Red LED lights with a light output of approximately 270 milliwatts (mW)*. Frequency tolerance +/- 1 Hz. The manufacturing of the SOTA Products is a global collaboration. The following countries participate in the making of the LightWorks (listed in alphabetical order): Canada, China and Hong Kong. The LightWorks Model LW1 is covered by a three (3) year limited warranty. Please keep proof of purchase. Warranty is void if the failure is due to abuse or negligence. SOTA reserves the right to make changes to the LightWorks without obligation.